Bačvice is the nearest beach from city center (about 15 min walk). This beach is the most popular among tourists as well as locals. Traditionally the locals play a popular game with the ball, called picigin. The beach is shallow up to 50 meters, making it popular with non swimmers and families with children. There is a beach bar above the beach. This beach has a blue flag which means it’s one of the cleanest beaches. The beach is sandy with some parts paved, offering access to physically challenged people as well. There are bars, restaurants and pastry shops near in which you can refresh with a versatile food and drink offer during summer heats. 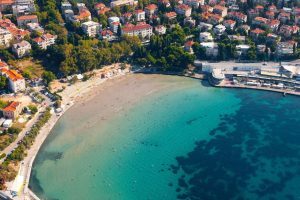 The Kašjuni Beach is a beautiful pebble beach located at the foot of the hill of Marjan in Split, about 2.5 km away from the city center. 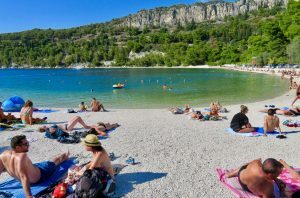 The beach can be reached by car, on foot or by boat, which runs every hour from Matejuska in the center of Split to this idyllic beach. Driving with this boat will give you the opportunity to enjoy the beautiful panoramic view of the city and thus complete your beach experience. There are two catering facilities on the beach, one is a beach & lounge bar where you can enjoy a refreshing drink or afternoon coffee and the other one is a restaurant offering a wide range of delicious dishes. This beach is ideal for young people as they enjoy after beach parties with the sound of excellent music. However, it is also suitable for family vacations due to fine gravel and mild sea entrance. For relaxed vacation on the beach it is possible to rent sun loungers and parasols as well. 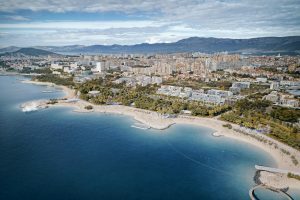 Everyone looking for fun and active vacations will not be disappointed on the beach of Kašjuni. It is possible to rent a kayak, sea bob and stand up peddle (SUP) board, which will surely complete your vacation and leave unforgettable memories. If you want to relax completely during your vacation, you can also find massage tents on the beach. Essential oils and pleasant massage will help you to completely forget all your worries and problems. 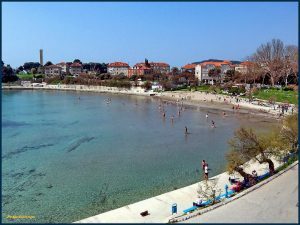 Žnjan is the biggest beach consisting of about 5 small beaches. You can reach it by bus 15 from the center, or a half hour walk. At the moment there are no coffee shops or beach bars, but there are plans to build a hotel, maybe even this season. Here you can find a beach for dogs, and a beach for disabled people. 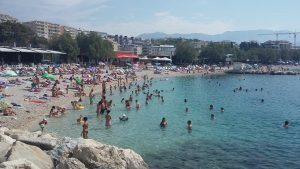 It is one of the most favorite bathing places in Split, especially among water sports lovers. The beach is mostly rocky with parts of it covered with pebbles. There are a few bars in the neighborhood in which you can refresh with a versatile drink offer, as well as the restaurant in which you can savor the specialties of this region. There is the children’s park in which they can have fun while they are not in the sea. 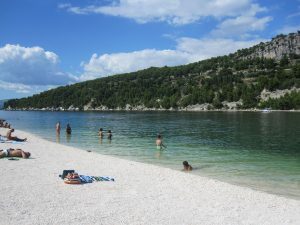 The Žnjan beach is ideal for families with little children, romantic couples, older people, singles and younger people. Because of the newly built sea access, bathing will be much more pleasant for the physically challenges now. The beach contains outside showers, public toilets, changing rooms and offers the possibility of renting deck-chairs and umbrellas.